Hammers and sickles on a red background. A caricature of Vietnamese Communist leader Ho Chi Minh. This looks like a propaganda piece from ages ago. Except that this ad was up until this past Monday, and they’re about Ben Chin, a third-generation Chinese American running for mayor of Lewiston, Maine. He’s running on a platform of a new resident-owned housing model and immigrant integration programs, among other city revitalization initiatives. After finding his campaign faced with racially-motivated attacks, Chin responded by recalling his grandfather, who was targeted as a possible communist solely because of his Chinese heritage. “It is very sad for me to know that those days are not yet behind us, that [my wife and I are] bringing a child into a world where this is still contested,” Chin said. 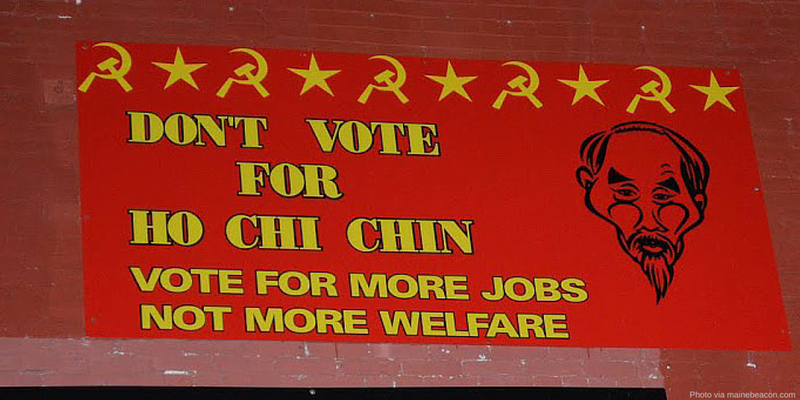 In the case of Ben Chin, both Democrats and Republicans have condemned the ads as racist. But racial attacks on Asian Americans who dare to put themselves forward in the political sphere continue to be infuriatingly regular, signaling a dangerous dismissiveness toward Asian Americans and racism directed at them. In 2008, attack ads in Minnesota darkened the skin of Indian American candidate Ashwin Madia. Similarly, mailers sent out by Maryland State Senator Nancy King in 2010 deliberately darkened the skin color of her fellow Democrat opponent, Saqib Ali, who is of Indian and Pakistani descent. Perhaps most infamously, a 2012 Senate campaign ad by Republican Pete Hoekstra featured an Asian woman speaking in broken English thanking Hoekstra’s Democratic opponent for making China stronger at the expense of American jobs. Despite their flagrant disregard for the Asian American community, the politicians and campaigns that released these ads calculated a greater political benefit in denigrating Asian Americans than in appealing to all Americans regardless of race, creed and religion. Instead of celebrating America’s diversity and inclusiveness, they chose to present Asian Americans as the “other” who don’t belong and make damaging insinuations regarding the loyalty of nearly 18 million Americans. But rapidly changing demographic and political trends should give pause to anyone considering the same tactics in the future, if only for their own self-interest. Asian Americans are the fastest growing racial group in the U.S. We’re seeing dramatic growth in Asian American registered voters across the country and in unexpected places, like Nevada, where that number grew 157 percent from 2004 to 2012 — faster than any other racial group. Still, Asian American and Pacific Islanders (AAPIs) reported the lowest rates of contact by political parties, suggesting that politicians remain unaware of the potential influence and strength of the AAPI vote. AAPIs will represent 5 percent of all voters by 2025, and in several states the number of AAPI voters exceeded the margin of victory in the 2012 election. Asian Americans’ votes remain largely up for grabs with many identifying as independent, making the low contact rates by politicians all the more baffling. What is becoming ever more clear is that politicians ignore Asian Americans at their own peril. While we’re still seeing problematic racially charged rhetoric and political ads, we’re also seeing strong immediate responses from the Asian American community and from those who understand it’s not acceptable to continue treating millions of Americans as foreigners. We plan to keep reminding Americans that embracing our country’s strong values of diversity and inclusiveness is not only the moral thing to do, it’s how to win elections. Isaac Chae is an intern at Advancing Justice | AAJC.